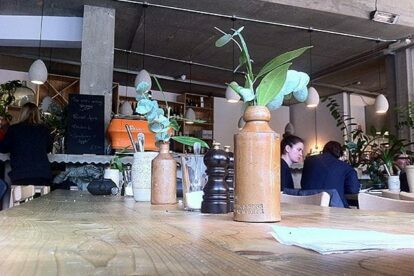 Raw Duck is what you expect a modern Hackney eatery to be – concrete for the basis of the bar, walls and ceiling, long refectory tables for the main eating areas while one wall displays the wines and pickling jars and a turntable supplies the musical backdrop. Staff change the LPs as they work, but I think customers are also welcome to change the album once a side has finished playing. It’s modern brutalism but toned down by the plethora of plants everywhere. They soften the sound and add a living green wall down the middle of one of the refectory tables. It’s a visually stimulating environment, but the main reason I go is the fantastic brunch! The harissa eggs on charred flatbread, Greek yogurt & coriander is the star dish for me, but I would also highly recommend the avocado, poached eggs, sourdough, coriander & chili. They are both incredibly tasty and filling and set you up for the rest of the day perfectly. An interesting part of the Raw Duck experience is the drinking vinegars/ferments – they make all the pickles, ferments, jams and drinks in-house. I can’t count myself as a firm fan of them, but the cranberry & orange zest drinking vinegar was zesty and they are well worth trying. The evening menu has great sounding dishes like char-grilled lamb leg & wild garlic green sauce and I’m sure they are great but the brunch menu is so good I always seem to find myself there at that time of the day!